The scheduled date of 15th January for the visit to Warsash turned out to be cold and wet so the visit was postponed until later in the week. On Friday 20th of January the weather had settled down to be bright and sunny with the temperature barely above freezing and this turned out to be the day of the postponed visit. Conditions in January are never ideal but with sunshine producing good visibility and with adequate clothing even freezing temperatures could be tolerated provided the wind stayed away. A low tide during most of the walk also improved the chances of seeing more of the expanse of mud flats and hence more of the wild fowl. The walk on this occasion was split into two halves from the car park at Shore Road in Warsash. The first half was in a southerly direction along the bank of the river Hamble towards the sea and the second half was northerly along the raised path between the mud banks. The Loch Ness monster was the first sign of animal life although this was in the form of a model placed in the mud alongside a jetty which was fully exposed due to the low tide. Twitches in the heaps of bladder wrack seaweed drew the attention to Turnstones foraging for food. Their mottled black back feathers make them difficult to see without searching for them. A pair of Brent Geese lying on the ground were similarly disguised but predators large enough to take advantage would be difficult to imagine. Black bellied Brent Geese increased in numbers as the walk continued. Flocks gathered at the water’s edge and geese came and went in small numbers as they flew to fields looking for food. Their numbers were only exceeded by the Wigeon which seemed to line the edge of every creek and inlet through the mud. Most of the Wigeon were resting with heads tucked under the wings but some groups on the water were fighting prior to pairing for the year ahead. Oystercatchers were present in groups mainly confined to their own spit of shore. Curlew and Godwits usually kept to themselves as did a single Grey Plover which are more often associated with large flocks. The Grey Plover obligingly took a short flight over the mud bank and enabled the black patch under the wing to be seen which is a good means of identification at this time of year. A small flock of Dunlin were seen feeding along the water’s edge which because of the low tide was some distance away. Plant growth has almost stopped at this time of year but because of the maritime climate some are still recognisable. The grass on Strawberry Field for instance was still a verdant green and the invasive species of Alexanders had already started new growth alongside the coastal path. Sea Purslane also grows vigorously in this area with its olive-green leaves and shrubby habit sometimes supported in the hedgerows. Shingle replaced mud as the walk got closer to the sea and plants such as Sea Beet already had this years growth of shiny green leaves. The feathery shrub that grows in patches at Warsash and also across the water at Lepe is Tamarix or Saltcedar. As its name suggests this plant is tolerant of salty conditions and grows in many coastal areas of the world. 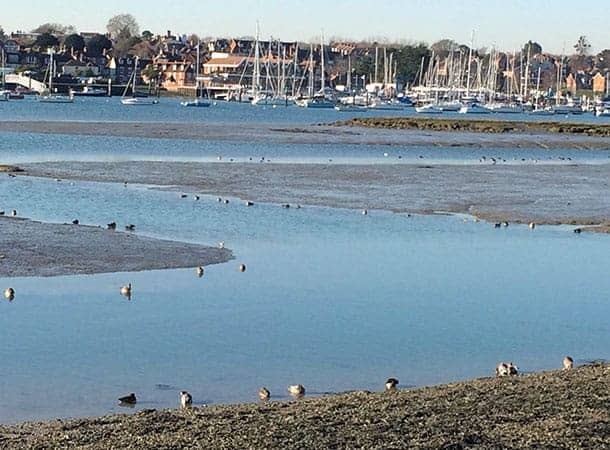 The walk along the raised path to the north revealed many more Wigeon and other waders which almost outnumbered the number of boats moored along the river Hamble. Some time was spent watching a lone Kingfisher as it flew from post to post looking for food in the gullies between mud banks. The low winter sun picked out the chestnut brown front of the bird and lit up the electric blue of its back feathers producing a spectacular sight. A very pleasing sight to the end of a bright winters day. The indoor meeting for January was the Annual General Meeting followed by an American Supper. The usual format was followed with reports from the Chairperson Felicity Beard, Treasurer Dawn Kemish and Secretary Jill Bascombe followed by elections of committee members. Against a background of falling numbers and receipts at many clubs in the area the Waterside Natural History Society appears to have turned the corner. Membership numbers were slightly up on previous years as was attendance at indoor meetings. The treasurer Dawn Kemish also reported an increase in funds over the year due in no small part to a donation from the Esso community fund. Election of Committee members was completed in record time by the simple process of re-electing existing members. Any other business was taken up largely by the question of whether to amalgamate with the Southampton & District bird club but nothing was decided in this regard.